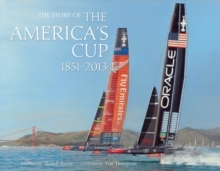 Awe-inspiring and breathtaking, this volume takes sailing beyond its competitive limits; throwing caution to the winds, it is exciting and terrifying at turns, as it highlights some of the world s most technical yachts and the skills of the men who sailed them The Story of the America's Cup 1851-2013 tells the chronological history of 150 years of the most exciting and exhilarating yacht race, open the pages and you can almost feel the wind in the sails and the salt spray. Full page color illustrations bring the yachts alive, set as they are in their natural element, at sea, on the waves; detailed descriptions give an amazing insider's view of the construction of individual boats, the routes sailed, the crews, the highs and lows of what was undoubtedly, extremely tough and competitive sailing, the victories and the defeats. Paintings by Tim Thompson, a leading marine artist are an integral part of the book's appeal; he has captured the pure essence, the spirit of the race and its place in history.